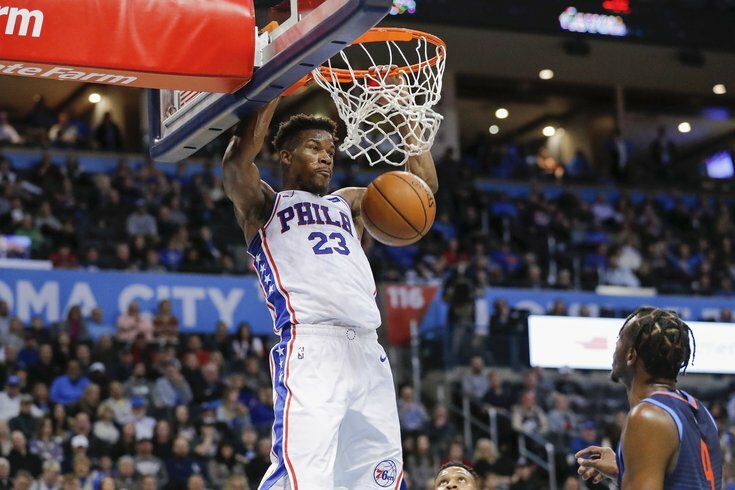 Philadelphia 76ers guard Jimmy Butler (23) dunks as Oklahoma City Thunder forward Jerami Grant (9) looks on during the second quarter at Chesapeake Energy Arena. Each team in Oklahoma City had to go to work without an MVP candidate on Thursday night, it was Philadelphia who ultimately overcame the big hole in their lineup. Behind strong efforts from Jimmy Butler, Ben Simmons, and Tobias Harris the Sixers picked up a big 108-104 win on the road in Oklahoma City in order to snap a huge, 19 game losing streak against the Thunder. Joel Embiid will be upset he wasn't able to break the streak himself, but the Sixers head back home in good spirits after the win on Thursday night. Here's what I saw in the game. • You could not have asked for a better start to the game from the Sixers on the offensive end of the floor. The Sixers need to figure out their collective identity, but even in this early period, it is pretty clear they know what strengths they need to lean into for each of their star players. Within the first five minutes of the game, the Sixers showed off all the different things they can do. There was Jimmy Butler finding Jonah Bolden for easy layups on pick-and-rolls, Ben Simmons posting up the smaller Russell Westbrook, Tobias Harris dominating isolation matchups, and JJ Redick cashing in on handoffs. The Sixers created good looks, and more importantly in the short-term, they were knocking down almost all of them. Long-term, it's the fact that they've figured out how to use all these parts that really matters. Instead of shoehorning a bunch of players into a system, they're building more wrinkles into the system to accommodate the talent. • I think it has been taken for granted how quickly Harris has been able to get up to speed in Philadelphia. You would never know that he only just joined the team at the NBA trade deadline — if you just had someone watch a game without any knowledge of the Sixers or the NBA at large, you could easily convince them Harris has been in Philly for years. It may be a byproduct of how his career unfolded to date, with Harris having to adjust to several new teams already in his career. But no matter what the Sixers are running or doing, he looks comfortable. He flashes as a cutter away from the ball, he positions himself well on kick outs from post-ups, he makes the simple reads as a passer in transition, there's really nothing he can't do offensively. Harris was an absolute killer in the fourth quarter against Oklahoma City. He was great for the whole game, but when it got tight in the fourth quarter, he had some bonkers makes from deep. Who has the confidence and the skill to take heat checks in the middle of a close game? This guy does. When it's all said and done, his acquisition may be even more important than Butler's, and Butler has been awesome since joining Philadelphia. It's pretty obvious why Elton Brand gave up so much to get him. • We'll get into some Jimmy Butler gripes below, but I think he still contributed plenty of positive on Thursday night. He appears to be carrying himself more as a point guard with each passing game, and while he has never been a Simmons-level passer, he is finding guys at their spots, leading to a lot of clean looks near and far from the basket. Somebody has to be the guy that is sacrificing shot attempts in this group, and if Butler is going to be the guy, so be it. What's important is that he still produces value from his touches in some way — is he scoring efficiently, playing lockdown defense, and/or creating at a high level for this teammates? Those questions are just as important as, "How many points did he score?" When the second half started, his passiveness disappeared. The Sixers fought off several Thunder rallies behind Butler's timely scoring, which must be noted before we discuss him more below. • When Simmons is dialed in on the defensive end of the floor, there are few guys like him in the NBA. He has the quickness to guard guys like Westbrook, the size and athleticism to hang in the air with Jerami Grant, and for short spurts, the bulk to put a body on Steven Adams, one of the toughest dudes in the NBA. One fun wrinkle from this game, in particular, was Simmons getting to treat Westbrook like opposing teams normally treat Simmons. He hung back from OKC's point guard for a lot of the evening, and while Westbrook was able to take advantage by using the space as a runway at times, Simmons was there to close lanes off more often than not, standing his ground by the rim and fending off Westbrook. Simmons at center look continues to be an interesting wrinkle for Philly heading into the stretch run. We're going to learn a lot about this team before mid-April, and his versatility will be at the center of that story. • The Sixers needed the best from their three remaining stars on Thursday night with Philadelphia banged up, and they delivered. They went about their business in very different ways, but each of Butler, Simmons, and Harris was integral to the win. The better they are without Embiid on the floor, the higher the ceiling for this team goes. It's looking damn high at the moment. • Jonah Bolden has shown flashes in the limited play time afforded to him over the last few months, and he's the Sixers' most natural looking big in the pick-and-roll. He can get up and finish and he has good enough fans to collect the ball in traffic. But man does this guy need to learn how to stop fouling so much. That's a big part of why I think Brett Brown needs to go to him often down the stretch — the Sixers need him to understand the nuances of playing center, because that will be his primary role on this team, playoffs or otherwise. Some of his issues can't be fixed this season, like his weight/strength, so it's not going to be perfect. But playing time will help him understand positioning and his responsibilities better, which will benefit everyone in the long run. End of the day, I think there is ultimately more good than bad here. He just needs to figure out how to stay on the floor, and with a healthy Embiid he's only playing short shifts anyway. • The Sixers didn't exactly have a surplus of options against Oklahoma City, but every minute Amir Johnson was on the floor was a complete waste. Philly was basically playing four vs. five on the offensive end, he didn't offer them much on defense, and this won't score any points in Brown's favor from his detractors. I'm not a Justin Patton backer yet — he has looked way too raw defending in space when I've watched him in Delaware to trust him against a bully like Adams — but it's hard to imagine him being worse than Johnson was. And Bolden should have played more minutes than he did on Thursday anyway, which would have helped avoid more Johnson minutes. • Speaking of bad bench players, the Sixers continue to get nothing from the wings they brought in at the trade deadline. It was James Ennis' turn to get minutes on Thursday night, and it feels like the guy fans will want in the lineup will change every time they have to actually watch one of Ennis or Jonathon Simmons play. And not in a good way! • Ben Simmons' avoidance of the free-throw line really came back to bite the Sixers in the game's final minute. The Sixers should have been able to wind the clock down or at least force the Thunder to take a foul, but Simmons panicked when he had to stare down a potential trip to the line, and he turned the ball over trying to force it back to JJ Redick. It would be nice if Simmons didn't treat the ball like a virus in crunch time. To his credit, he came up with the biggest rebound of the game, and still had a great night, all things considered. As always, it's in the eye of the beholder here. The same people who usually get mad when I quibble with this will say "he's being unselfish!" and so on. But the Sixers did not bring Butler here strictly to defer. Not all the examples are so blatant, but he's getting himself to good spots on the floor throughout games and simply not taking the opportunities. I still think he needs to do a better job of walking the line between being a good teammate and using his attacking gifts. He's more than capable of doing so, and as we saw in the second half, he can turn it on and attack when he wants to. He can be a an unselfish teammate and still get to another level — that's not hating, it's knowing he's capable of more from watching him play. The easiest way for the Sixers to get to the next level is for him to find that balance. When he's taking a reasonably good layup attempt instead of kicking to, say, Mike Scott or James Ennis for a three, the Sixers are better off.